I am looking for honest feedback, from readers who like to read YA fantasy (people who have enjoyed books and movies like Once Upon a Time, the Harry Potter Series, Avatar: The Last Airdbender, Chronicles of Narnia, The Lord of the Rings Trilogy, Sailor Moon,...) If you are not sure if this is you, you can always download and read the Warriors of Virtue Epic YA Fantasy Series Sample. You can also read the series summary here. Note: This series is not suitable for children under 12, it is rated PG because of some disturbing content. Also the series is presented in Episodes; each episode contains 3 Chapters, not a complete novel. By joining the Review Crew, you will receive professionally edited and published Kindle Books in exchange for feedback. Let me know what you think of the story, characters, if something requires further explanation, if there is something you wish to see in the future… You do not need to write a book report; one or two paragraphs should suffice. Once you join, you will receive a few emails explaining how the program works and a free gift. Let me know, by replying to the email (or using the provided email address), which edition of the Kindle Book you would like to read and review, Text Edition or Artist's Edition (includes a downloadable poster of the cover art). I will email you the book as a Kindle Gift from Amazon. Make sure your email is valid and that you've added my email to the safe list, or check your Junk Mail folder. Follow Amazon's instructions to claim the book. After you read the book, email me your feedback and let me know if you would like to receive the following book in the series. I will send you the next episode as soon as it becomes available. Please note, criticism is appreciated, but discourtesy of any kind will not be tolerated. You cannot simply write: "This book is stupid." You can write: "This book is stupid, because..." (Though, I hope you will not use derogatory terms such as "stupid" to express yourself. ) If you are not sure what type of conduct would be appropriate, you can view Amazon's Guidelines. I reserve the right to remove you from the Review Crew at my sole discretion. You can also easily remove yourself by clicking on the Unsubscribe link found at the bottom of your welcome email. If you have any questions contact Mili Fay Art. 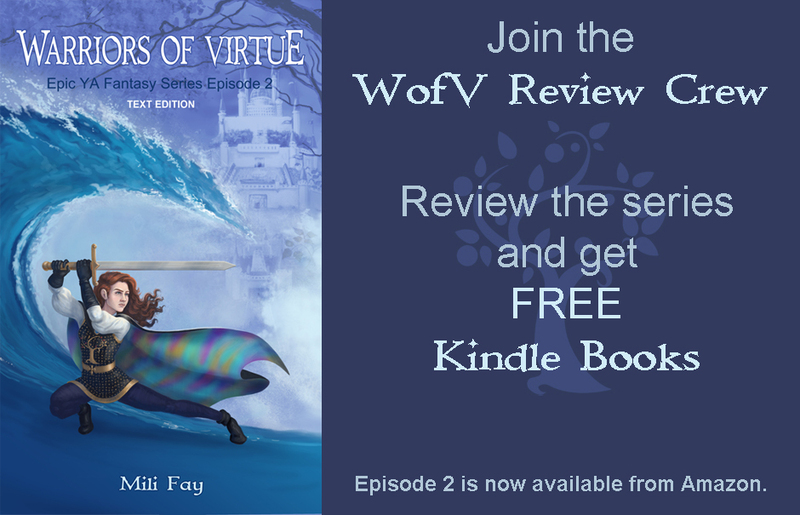 Read Warriors of Virtue: Epic YA Fantasy Series for free in exchange for feedback. * Kindle Books can be read on all platforms and devices by downloading Amazon's Kindle App. You can find out more here, or you can search Google: "how to download Kindle app for my device". Please be polite and courteous. Spam will not be published. © 2016 Mili Fay Art. All rights reserved. You may socially share content by linking to posts on this page. However, if you wish to embed or use anything on this page for your own work, contact Mili Fay Art using the form above.